Made traditionally, this crowdpleaser can pack a heavy calorific punch. But our fresher take swaps beef for pork mince while the béchamel is made with skimmed milk and olive oil to reduce calories and sat fat. It still tastes rich and indulgent, but is a little bit better for you! Heat a splash of the 2 tbsp olive oil in a large deep frying pan and cook the bacon until browned. Transfer to a plate with a slotted spoon, then add the pork mince to the pan and fry, stirring, until browned. Transfer the pork to the plate with the bacon. Add the remaining oil to the pan, then cook the vegetables for 10 minutes until softened. Stir in the garlic and cook for a minute or so. Add the wine, let it bubble for a minute, then add the tomatoes, stock pot, pork mince and bacon. Bring to the boil, then turn the heat down and leave to simmer gently for 30 minutes until thickened. Season to taste. Meanwhile, make the béchamel sauce. Put the milk in a saucepan with the bay leaves and peppercorns and bring to the boil. Remove from the heat and set aside to infuse. Heat the olive oil in another saucepan, stir in the flour and cook, stirring, for 2-3 minutes until it smells biscuity. Gradually stir in the warm milk (discarding the bay leaves and peppercorns) to make a smooth sauce. Cook, stirring, until thickened. Add nutmeg, salt and pepper to taste. Heat the oven to 200°C/180°C fan/gas 6. 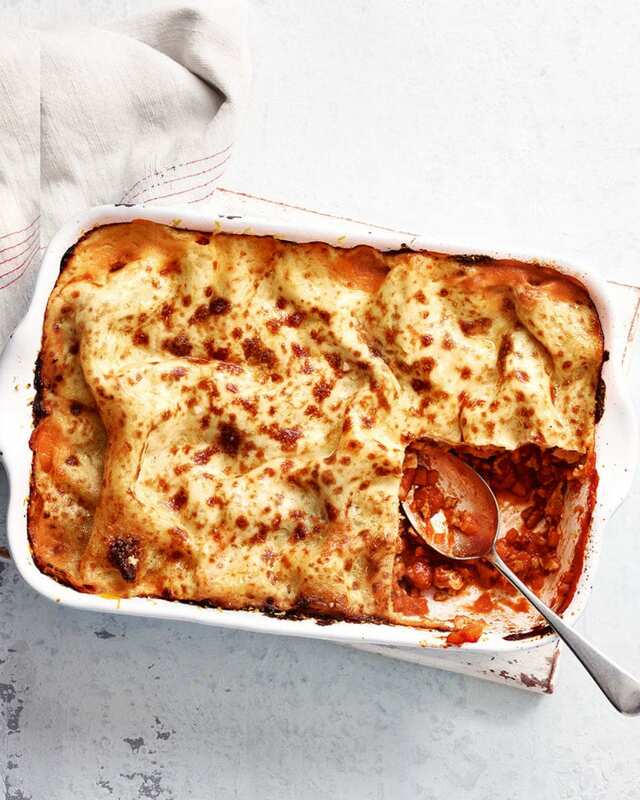 Spread a little ragù or béchamel in the base of a large (2 litre) baking dish, then add 2 pasta sheets. Next, smooth over one third of the béchamel, followed by half the ragù. Add another layer of pasta, half the remaining béchamel, then the rest of the ragù. Add the remaining pasta, then cover with the remaining béchamel. Sprinkle with parmesan and bake for 30 minutes until golden and bubbling at the edges. We swapped a beef ragù for a pork mince version. The béchamel is made with skimmed milk and olive oil to reduce calories and sat fat, but still adds a creamy richness to the finished dish.